Contest time, and today we thought we would combine our fan's favorites, pinning and winning. 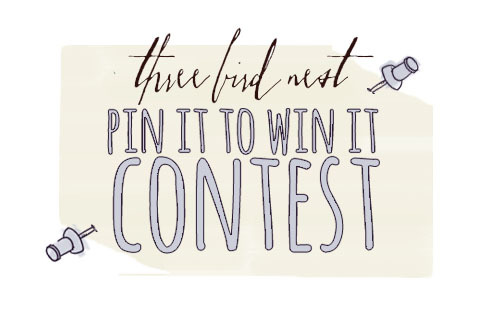 The rules are simple, you pin one of your new spring favorites from the Three Bird Nest website to your personal pinterest board, and the entry that receives the most repins wins the item they pinned. You must follow 3BN on Pinterest. To follow us visit our Pinterest. You may pin any 3BN spring item to any one of your existing pinterest boards. All of our spring pieces can be found in our What's New section of our website. This must be an original pin made by you from our website, your entry will not show if you repin one of our pins. You must hashtag both #threebirdnest and #springintoit in your pin description for your entry to be considered. Remember only the entry with the most repins will win. Entries will be accepted from 2/20/2013 until 2/24/2013 at 4 p.m. The winner will be announced in Monday, February 25th's, blog post.